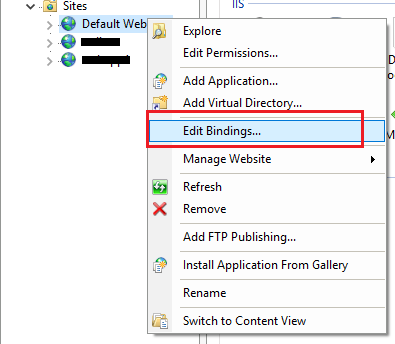 On Windows Server 2008 in IIS Edit Site -> Bindings option is not appearing. Try reinstalling the IIS and let us know what happens. Please, don't forget to mark as "Answered" if it helped you. Thanks. You can try to expand the Sites node and right click on your site and check if you can see "Edit Bindings..." option. Please share the screenshots of your IIS manager, so that we can understand and find the problem with your website better.